The spleen is the largest lymphatic organ and serves as a site where lymphocyte populations increase. 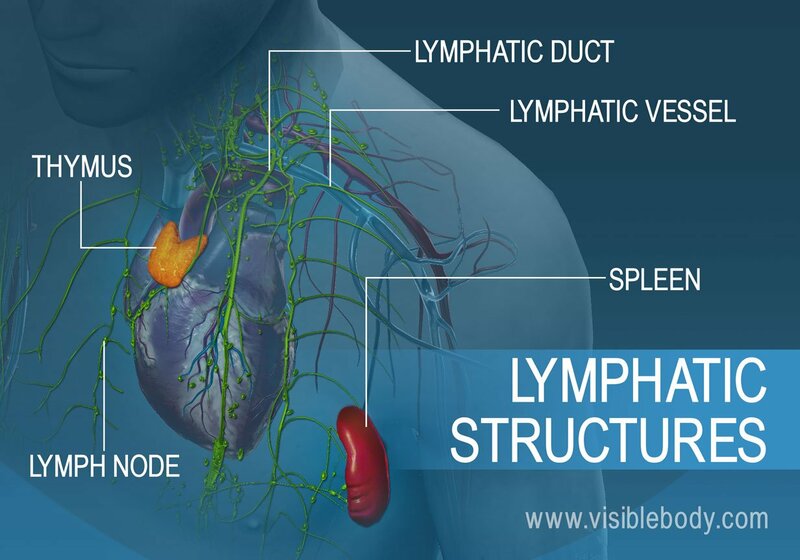 The lymphatic system includes a network of vessels, ducts, and nodes, as well as organs and diffuse tissue that support the circulatory system. These structures help to filter harmful substances from the bloodstream. Organs of the lymphatic system, such as the spleen, thymus, and tonsils, house specialized cells that destroy the harmful pathogens. 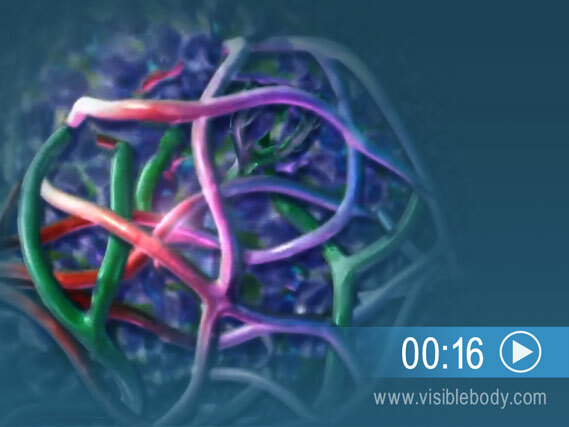 Lymphatic vessels and ducts provide the complex transportation network of the lymphatic system. These vessels carry a fluid called lymph away from body tissues and capillary beds to be filtered by nodes and organs, then returned to the bloodstream. 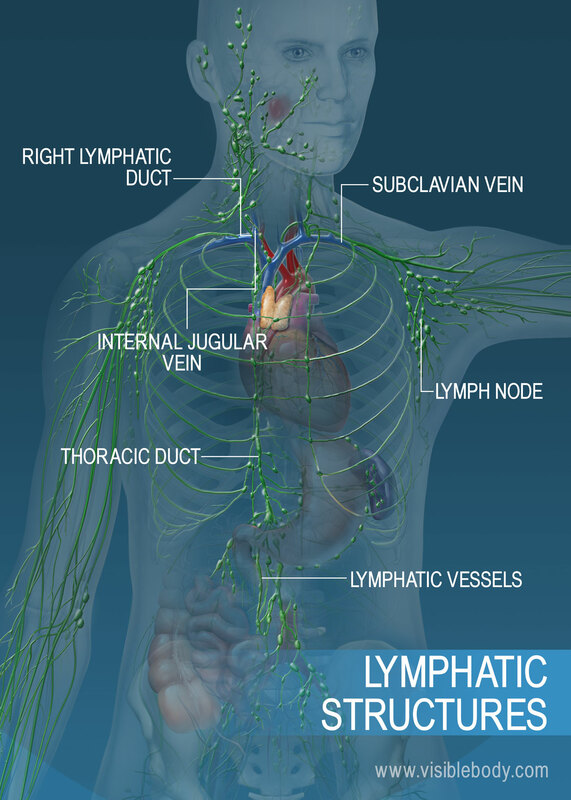 The lymph nodes and lymphatic organs provide the key functional sites of the lymphatic system. The lymphatic organs, including the thymus and spleen, and diffuse tissues contain lymphocytes and other defense cells produced by the bone marrow. The lymph nodes are interspersed along the vessel network and filter lymph. Node lymphocytes can enter the lymph vessels in order to eliminate pathogens. Lymph derives from interstitial fluid that surrounds the cells of body tissues. This interstitial fluid comes from the bloodstream, as capillaries exchange substances with tissue cells and fluid leaves the capillaries. Much of the fluid reenters the capillaries directly. The rest moves into lymphatic capillaries and vessels as lymph. Lymph is clear and colorless and contains white blood cells. The white blood cells can destroy pathogens and remove some unwanted substances from the interstitial fluid as it flows toward lymphatic tissues and lymph nodes. Here, concentrations of white blood cells called lymphocytes are added. Lymphocytes fight bacteria and other pathogens before the lymph flows back into the bloodstream. Substances are exchanged between the bloodstream and body cells through interstitial fluid. Part of this fluid enters the lymphatic vessel network as lymph and travels toward the lymph nodes. Lymph nodes are bean-shaped structures that help filter unwanted substances from lymph. They contain a high concentration of lymphocytes, a type of white blood cell that proliferates in the lymphatic system to combat pathogens. Groups of lymph nodes sit where the head and limbs meet the torso—at the axilla (armpit), groin, and neck—and in the intestinal region. During an infection, inflamed lymph nodes can sometimes be felt in these areas. Lymph originates from interstitial fluid that is formed where capillaries and body tissues exchange fluid and other substances. The lymph drains into lymphatic capillaries. The lymphatic capillaries conduct the fluid into larger lymphatic vessels, which carry it toward lymph nodes and lymphoid organs. 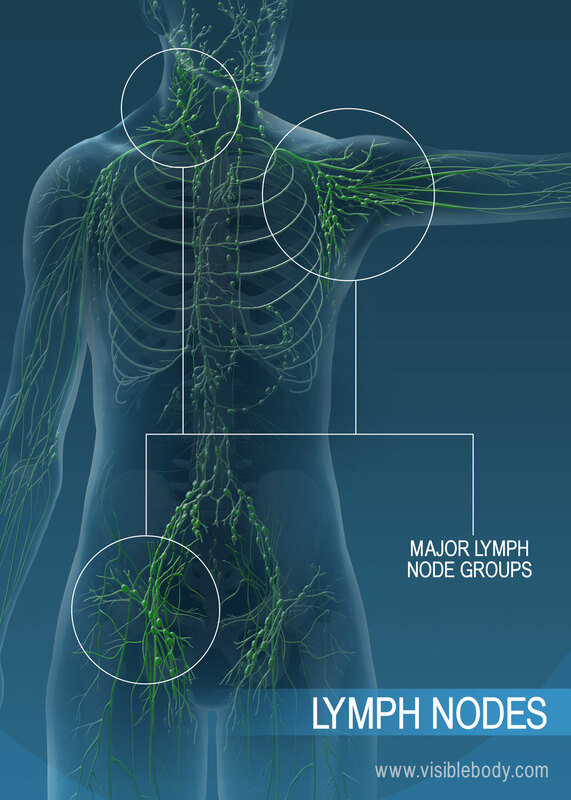 The nodes and organs filter the lymph and eliminate harmful substances. Filtered lymph then moves toward major lymphatic ducts—namely, the thoracic duct and right lymphatic duct, located at the junction between the subclavian and internal jugular veins. These ducts empty the filtered lymph into the veins to rejoin the bloodstream. 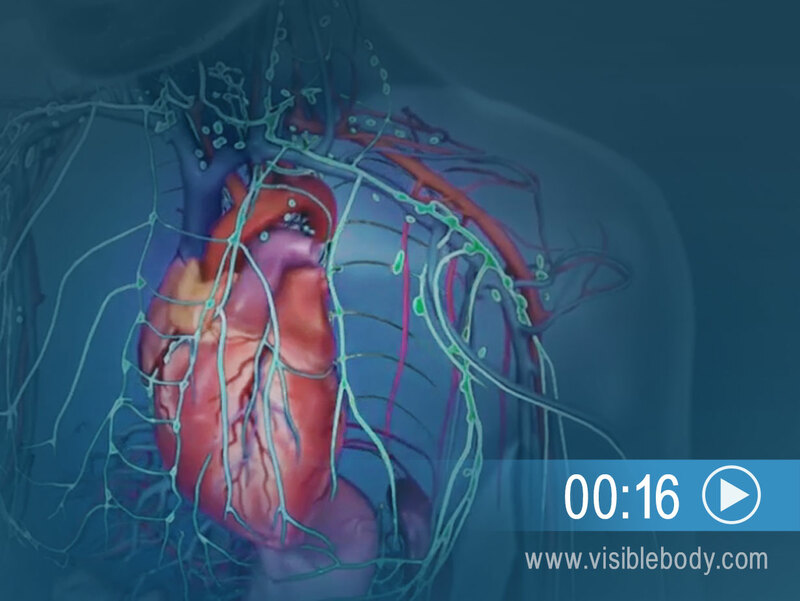 View a module about the lymphatic system on the National Cancer Institute’s website. A description of the lymphatic system from the 1918 edition of Gray's Anatomy of the Human Body.